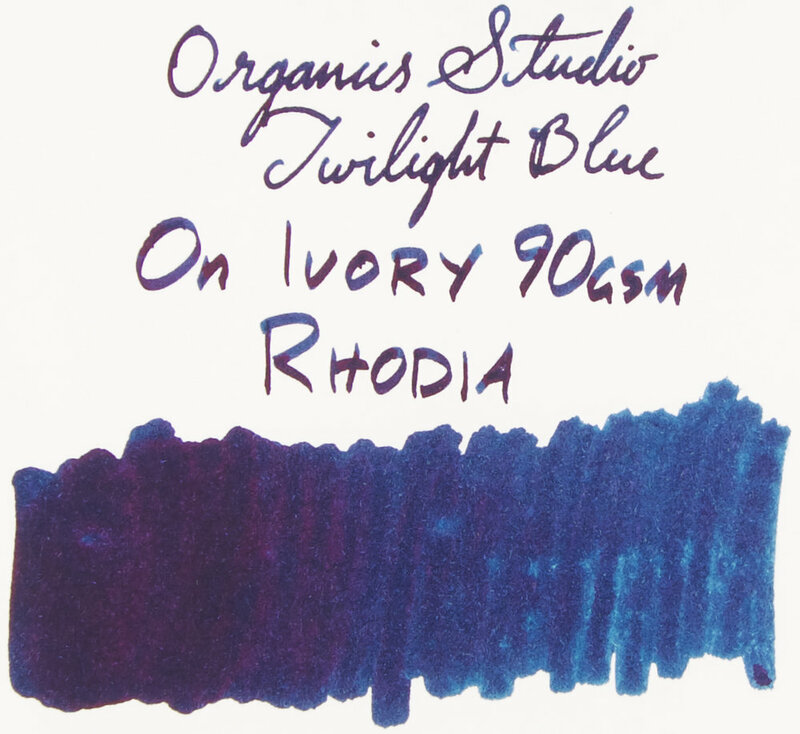 Organics Studio did what only few ink companies have done; made an ink that really creates a buzz. 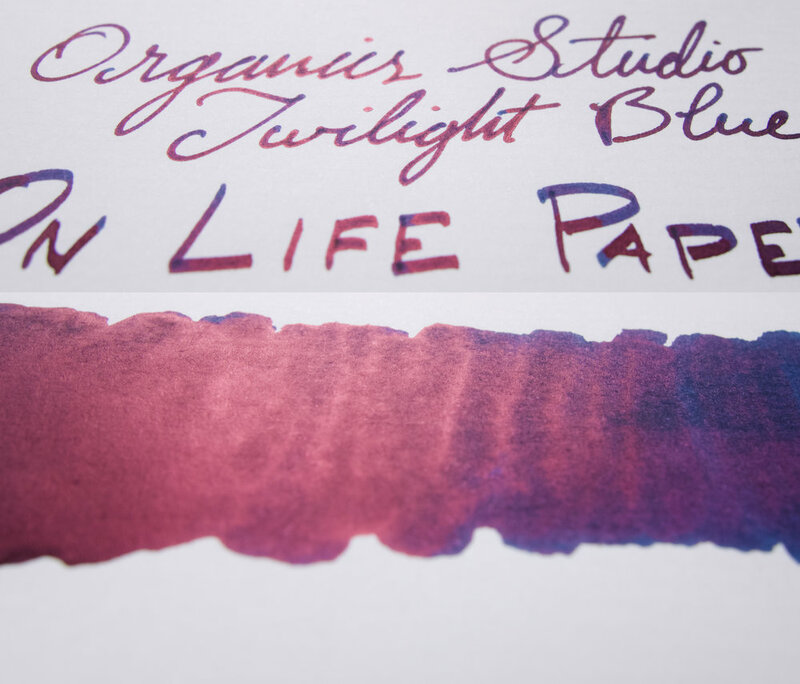 With Nitrogen Royal Blue, Organics Studio made an ink that everyone was (and still is) talking about. The same thing happened with J.Herbin's Stormy Grey and Emerald of Chivor, and also with Robert Oster Fire & Ice. 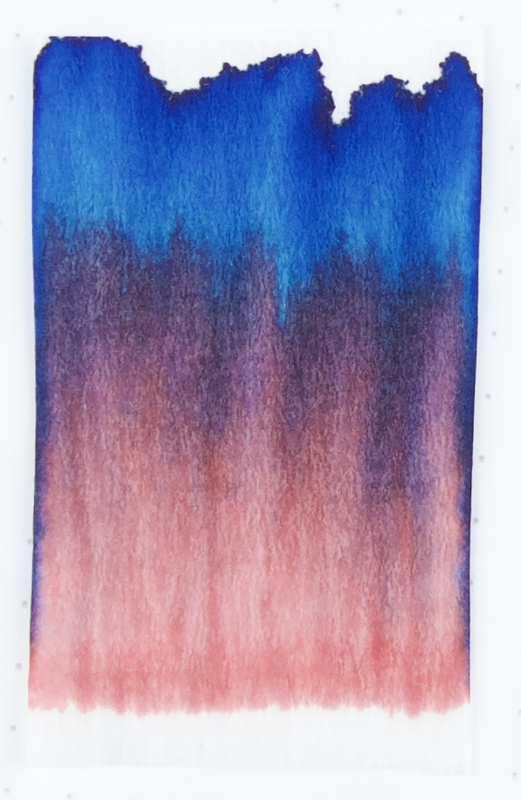 Nitrogen Royal Blue was unique because of the extreme amount of sheen it produced. 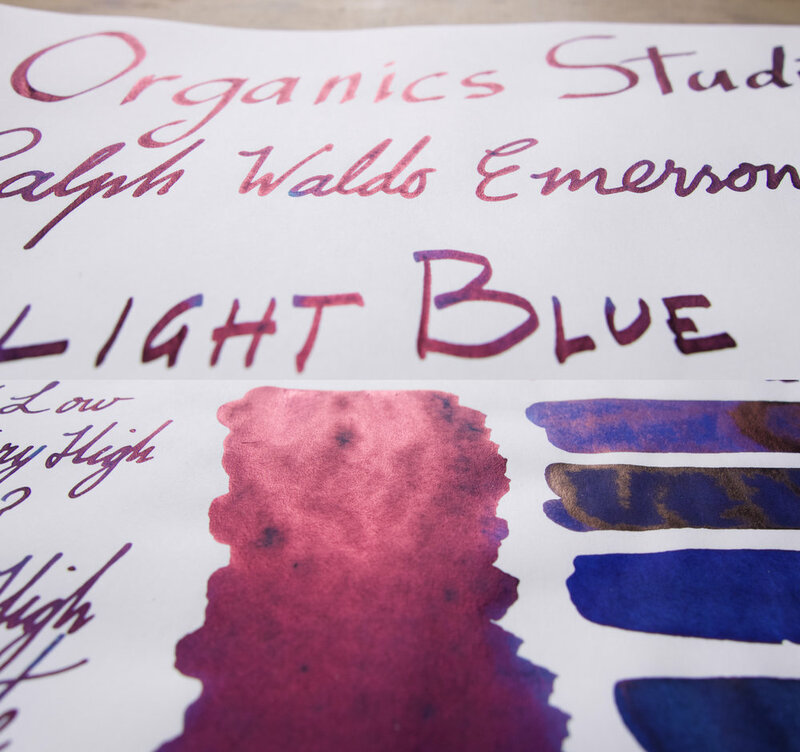 Organics Studio did the same extreme sheen with the more green Walden Pond Blue, and have now done it again with Ralph Waldo Emerson Twilight Blue. 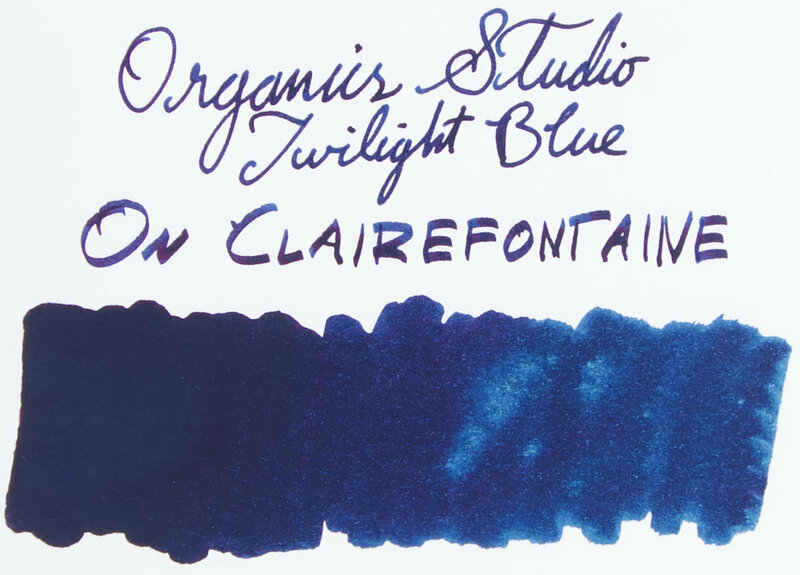 I bought Twilight Blue from Pen Classics in New Zealand (not a paid endorsement; Rene just runs a good shop). 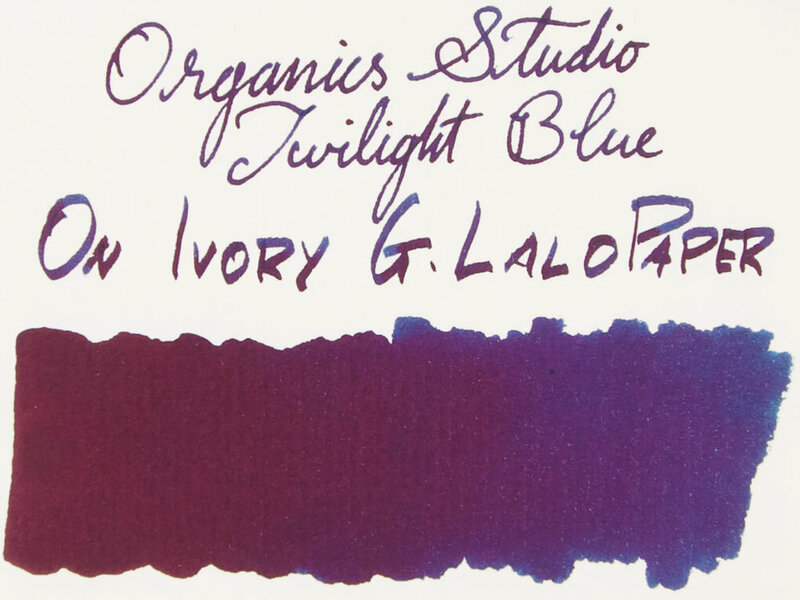 Twilight Blue is a darker blue; much Darker than Nitrogen Royal Blue but it is also a similar hue to Nitrogen Royal Blue. I wouldn't call it a blue-black as it doesn't have much 'black' to it. It's just dark; underneath that darkness it is still rich, vibrant, and saturated. The ink is very well lubricated and flows rather wet. It, like, Nitrogen Royal Blue and Walden Pond Blue do tend to dry out quickly when the nib is exposed and you have stopped writing, at least quicker than you might expect. This might be to do with what appears to be a very high concentration of dye (which the other inks also have). This high dye concentration might also be responsible for the sheen. The blue is very rich. It, like Nitrogen, leans more green than red (notwithstanding that the ink is more red than blue on some paper due to the sheen!). This is very much a blue ink, I only mean it is slightly more green than it is red. It feels like a very similar hue to Nitrogen but just darker. It shades fairly low on Tomoe River but better on Rhodia. I wouldn't call this a good shading ink. The ink, like, it's predecessors, fairs well on cheap paper. There's spreading but not much feathering and little bleeding. This ink does smudge but performs better in the regard than Nitrogen Royal Blue does. I also found it less messy, so that's a plus! On Tomoe River, the ink looks purple. There's so much sheen at every angle that although the blue peaks through, the red sheen is too strong to truely see the dark blue colour. The pens inked here are for "Organics Studio" a Pensive Pens with a Franklin-Christoph Music Nib, for "Ralph Waldo Emerson" a Chartres Blue Platinum Century #3776 with a Broad nib, for "Twilight Blue" a Black Platinum Century with a Dan Smith Architect grind off a C (or Double Broad) nib, and the fine writing is a Pensive Pens with a stock JoWo Fine nib. (These are used for the other writings as well). The compared inks are, from top to bottom, are Sailor Blue, Kobe Cosmo Blue 135, Diamine Lapis Blue, Noodler's Fountain Pen Hospital Manhattan Blue Black, Pen + Message Vintage Denim, Organics Studio Nitrogen Royal Blue, Organics Studio Walden Pond Blue, KWZ IG Blue #6, and to keep us honest a fluorescent pink (Sailor) Mitsukoshi Hana Hiraku. 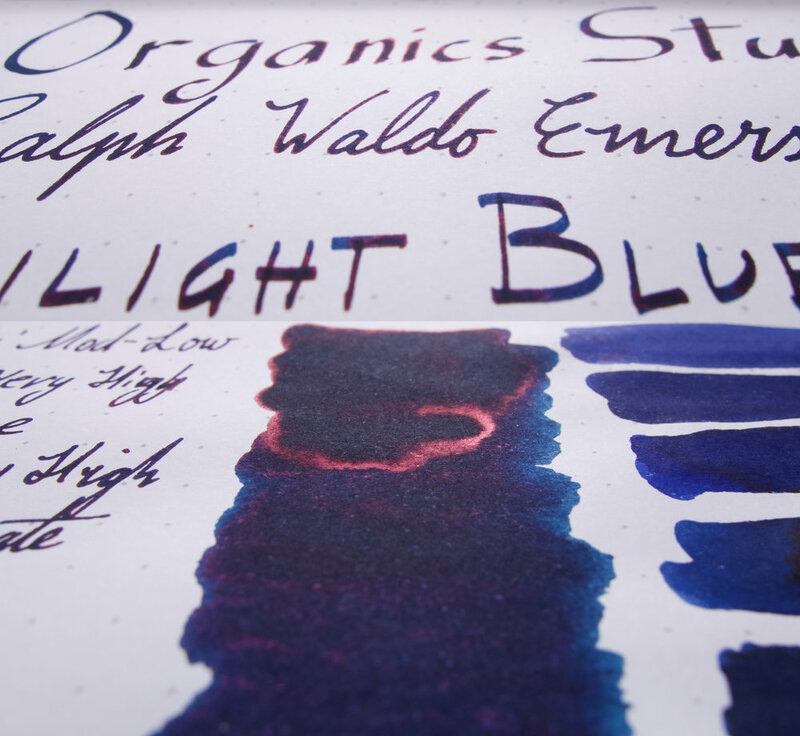 Sailor Blue is lacking the green, and is less Saturated and has a copper rather than red sheen. Kobe Cosmo Blue is too dark, lacking in contrast and is slightly more green but still not green enough. Its sheen is also brass coloured. Diamine Lapis Blue is no where near sheeny enough and is lacking the vibrancy of Twilight Blue. Noodler's FPH Manhatten Blue Black is comparably "green" but lacks practically all sheen and still isn't vibrant enough. Nitrogen Royal Blue is obviously much brighter and is more vibrant but is a comparable hue, as mentioned already. Walden Pond Blue has the same sheen but is noticeably greener. KWZ IG Blue #6 is way too dark (due to that it is an Iron Gall ink) but does have enough green. It lacks sheen vibrancy and saturation as well. Mitsukoshi Hana Hiraku is a little brighter in colour than the sheen of Twilight Blue! The Sheen is the same colour as Pond Blue; just slightly duller than Nitrogen. There is not that much sheen on Rhodia so you can see the dark rich blue much easier here. Much of the above comments apply here (with reduced sheen of course). The green of KWZ IG Blue #6 is less darkened here so you can see that the colour is decently comparable. Drytime is much better than I expected! Relatively slow on Tomoe River but decently fast on Rhodia. The ∞ symbol represents a smudge test. Here I let the ink completely dry out before moving my finger over it. Interestingly, although the ink has some green to it, there is a decent amount of pink that comes out of the Chromatography. There is no real water resistance to speak of. 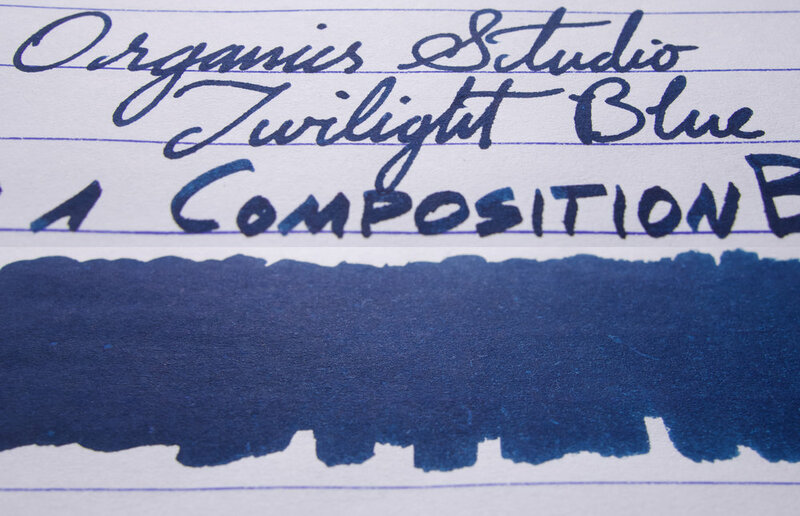 While Nitrogen Royal Blue had the barest hint of sheen on a Composition Notebook, I can't find any here. 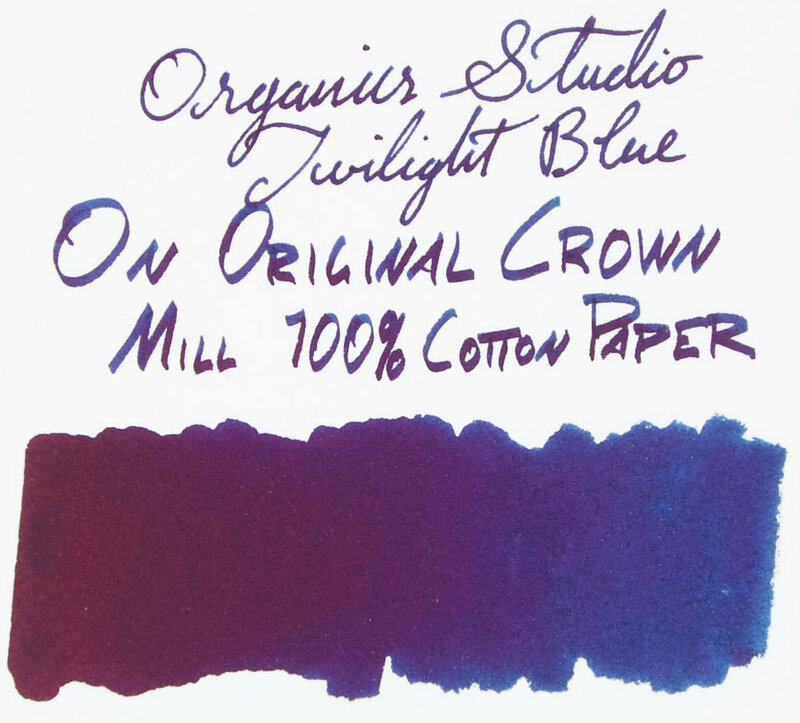 I'm continually impressed by the sheen on G.Lalo Ivory Paper and Original Crown Mill 100% Cotton Paper. This sheen is constant in that no matter the angle you view it at, no matter where the light source is, it is always pink. Impressive. I love the dark blue of this ink. 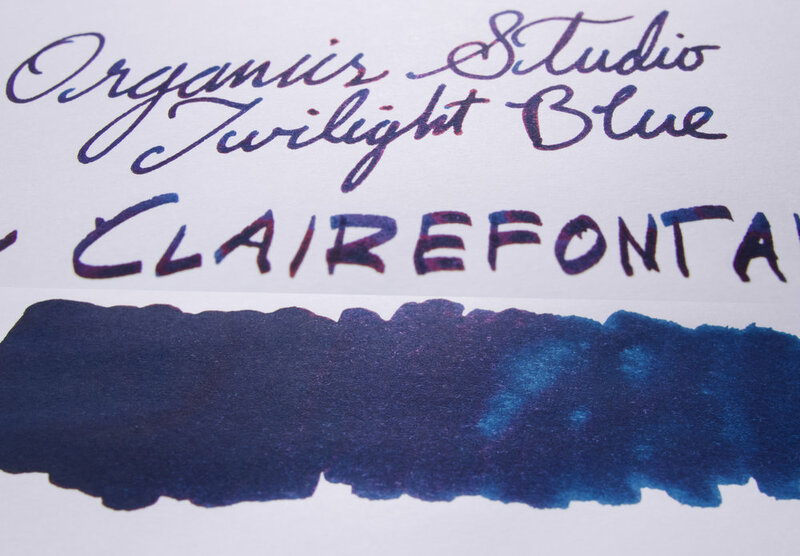 I love rich dark blues and I love sheen. What's not there for me to love! The drying out of the nib can be an issue, some might want an ink that is water-resistant, but these doesn't bother me personally. I'm a fan of this ink more so than Walden (I don't particularly like the hue of the ink colour) and more than Nitrogen (only because I prefer the darker colour here). I have three bottles of Nitrogen and Walden. I'll be picking up another of this sometime too! I don't know whether it's actually the third sheeniest ink in the world, but these three Organics Studio inks are definitely the three sheeniest inks in the world so it's at least amongst the top three! 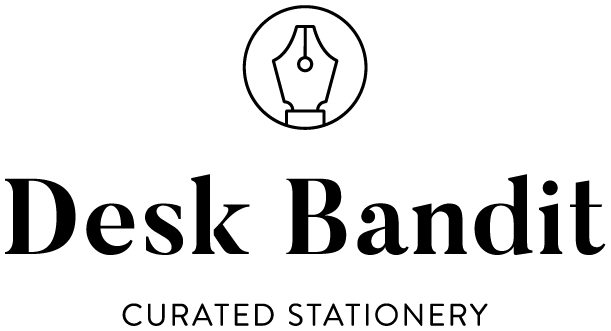 As mentioned I bought the ink from Pen Classics in New Zealand but is available from retailers around the world.